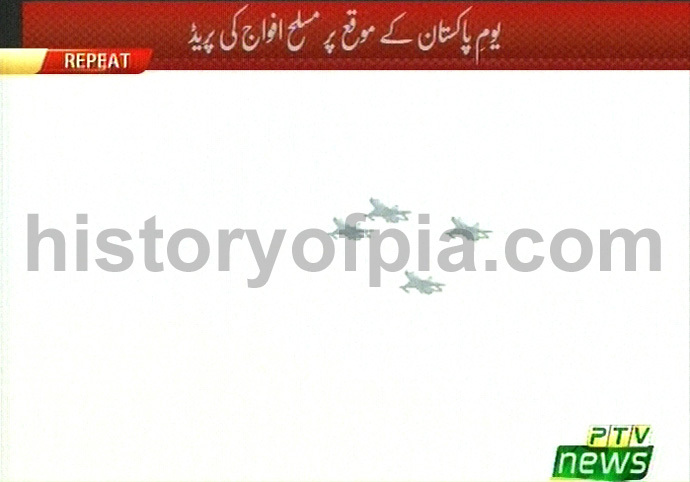 Aircraft taking part in Pakistan Day flypast rehearsals photographed on March 14. An F-16 Fighting Falcon of Pakistan Air Force (PAF). 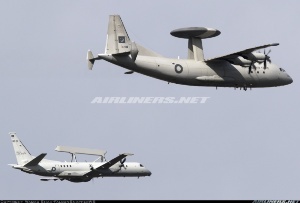 PAF KE-03 Karakorum Eagle Airborne Warning and Control System (AWACS) and Saab 2000 ERIEYE AEW&C. PAF KE-03 Karakorum Eagle Airborne Warning and Control System (AWACS). 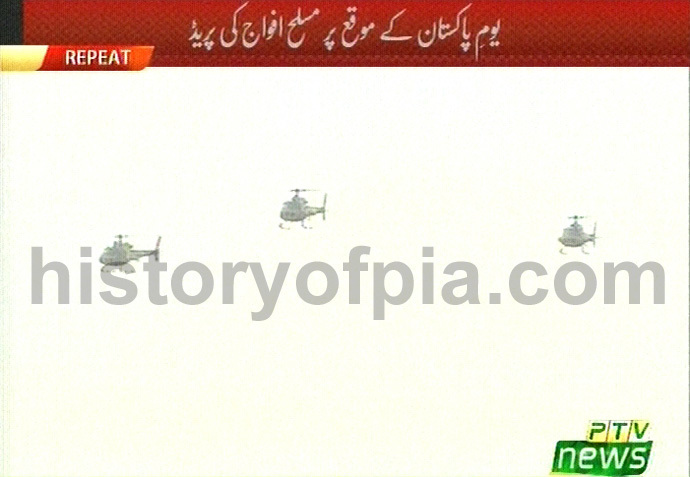 Pakistan Army Bell 412EP (Enhanced Performance) helicopters over Pakistan Monument. 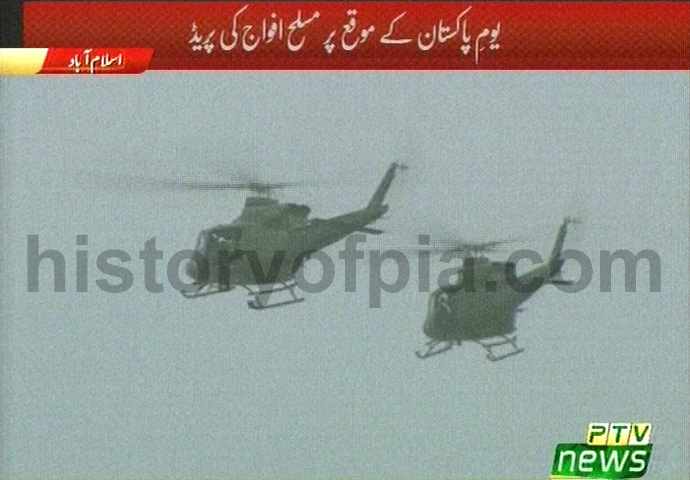 Pakistan Army Bell 412EP (Enhanced Performance) helicopters. Pakistan Navy Lockheed P-3C PUP Orion. 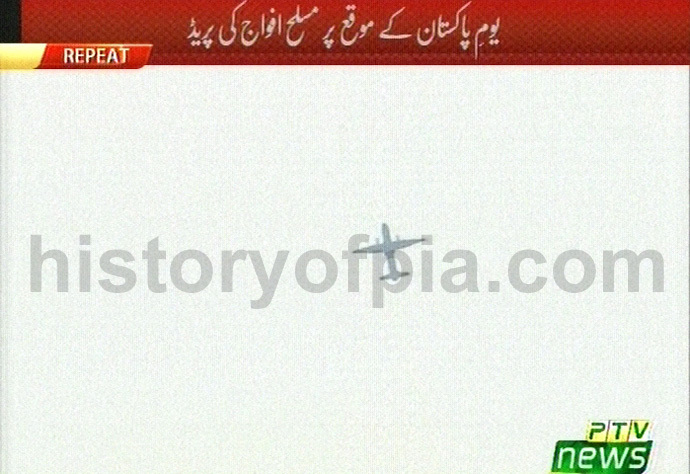 PAF F-16 Fighting Falcon solo display. Photos taken on March 16. 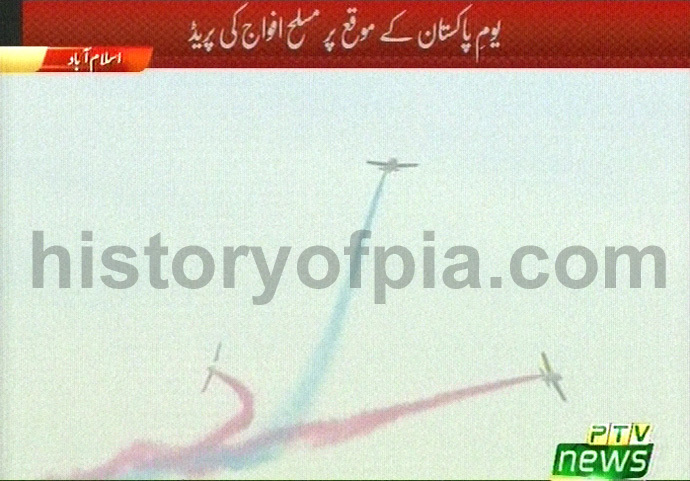 PAF K-8 Karakorum aerobatics team "Sherdils". 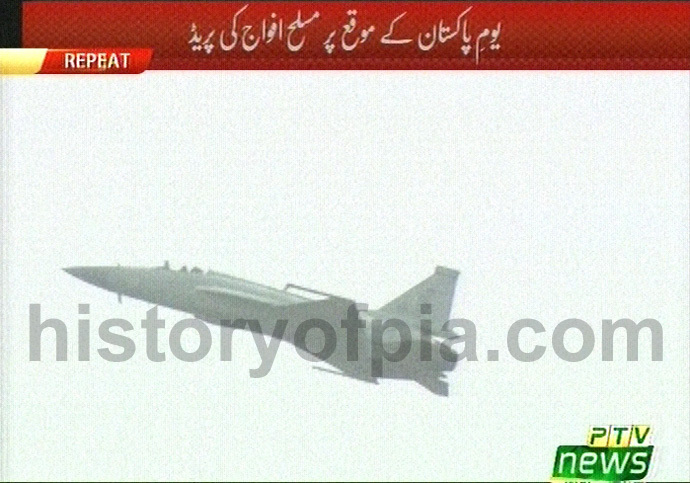 PAF JF-17 Thunder solo display. Photos taken on March 19. 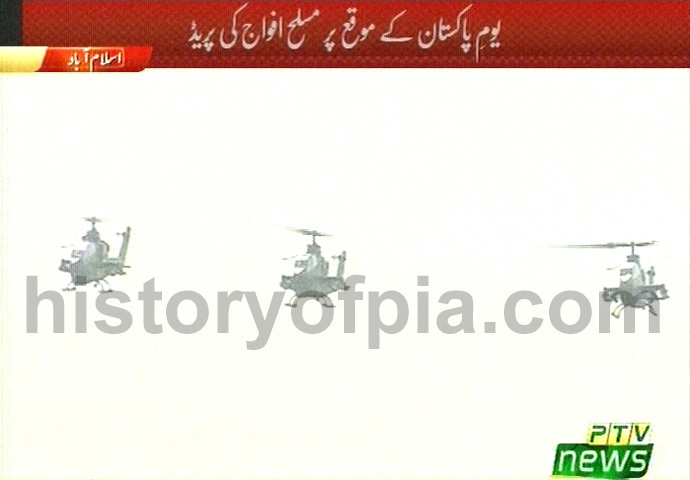 Pakistan Army Bell AH-1 Cobra gunship helicopters. Photos taken on March 21. 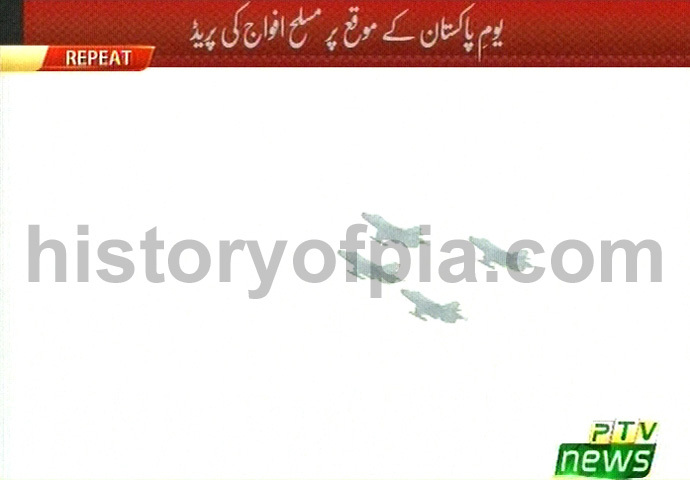 PAF Mirage V attack aircraft. Pakistan Navy Harbin Z-9EC Anti-Submarine Warfare (ASW) helicopters. PAF Chengdu F-7P Skybolt fighter/interceptor aircraft. 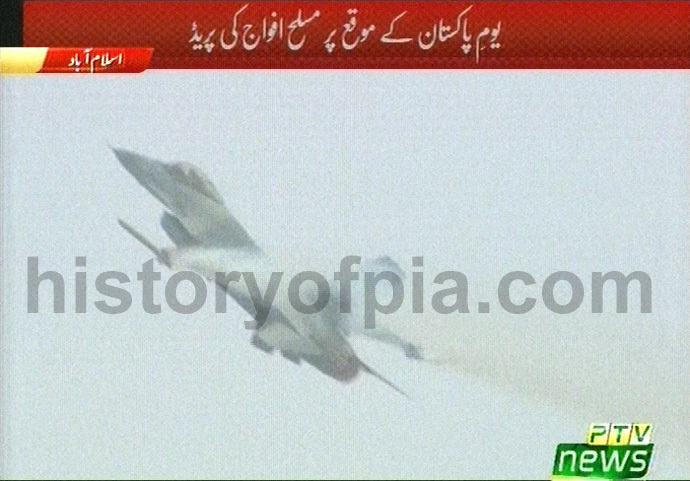 PAF F-16 Fighting Falcon multirole fighter aircraft. 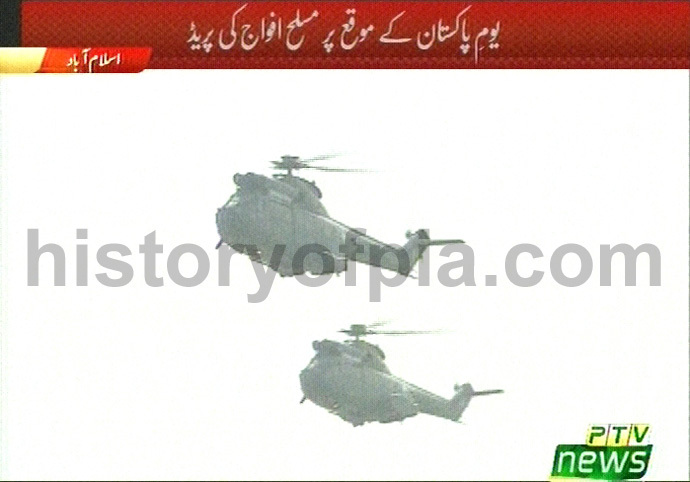 Pakistan Army CAIC Z-10 attack helicopters. 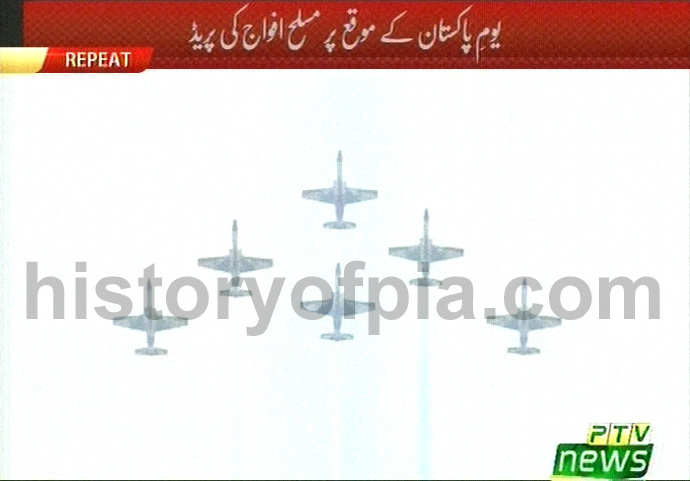 Pakistan Day March 23, 2016, flypast. Flypast was led by this Lockheed Martin F-16D Fighting Falcon of PAF No. 5 "Falcons" Squadron. PAF Air Chief Air Marshal Sohail Aman was one of its two pilots. F-16 Fighting Falcon multi-role combat aircraft of PAF No. 9 "Griffins" Squadron. JF-17 Thunder multi-role combat aircraft of PAF No. 16 "Black Panthers" Squadron. Chengdu F-7PG Skybolt fighter aircraft of PAF No. 20 "Eagles" Squadron. 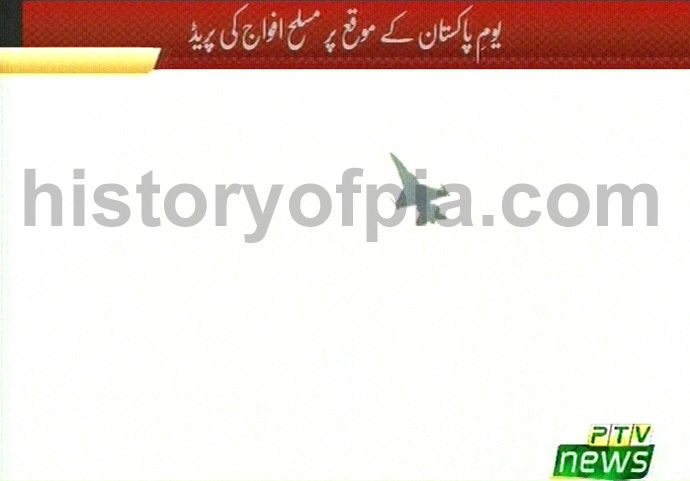 Mirage V supersonic attack aircraft of PAF No. 27 "Zarrars" Squadron. Chengdu F-7P Skybolt fighter aircraft of PAF No. 14 "Tail Choppers" Squadron. 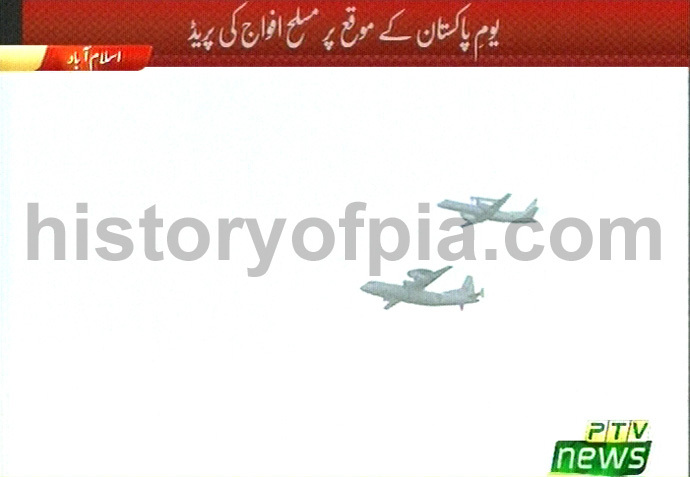 KE-03 Karakorum Eagle Airborne Warning and Control System (AWACS) and Saab 2000 ERIEYE AEW&C of PAF No. 3 "Angels" Squadron. 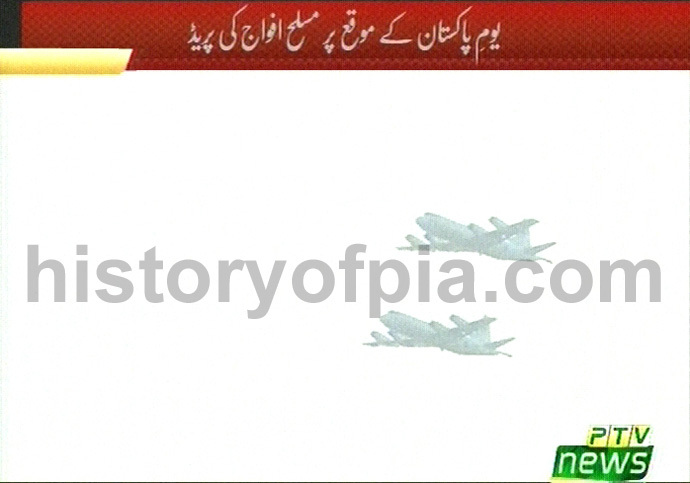 Lockheed P-3C PUP Orion of Pakistan Navy No. 28 Squadron. 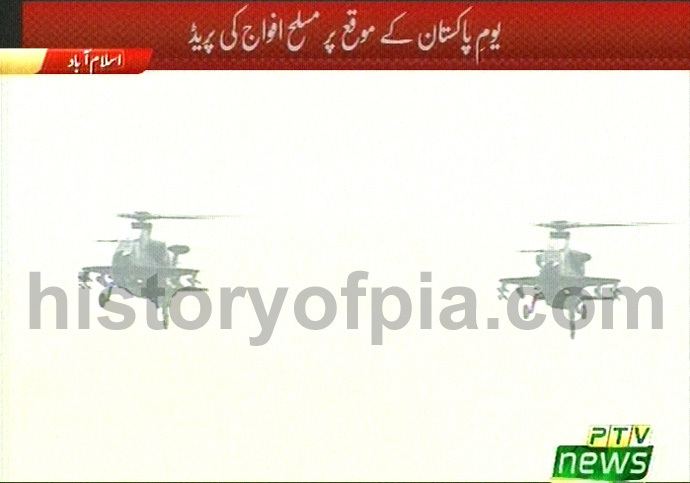 CAIC Z-10 attack helicopters of Pakistan Army Aviation. Bell AH-1 Cobra gunship helicopters of Pakistan Army Aviation No. 31 Combat Squadron. AS550 Fennec multi-purpose helicopters of Pakistan Army 101st Aviation Group's "Night Stalkers" Squadron. 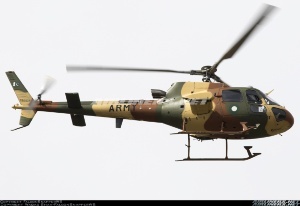 Pakistan Army Bell 412EP (Enhanced Performance) helicopters of Pakistan Army 101st Aviation Group's No. 25 "Sky Raiders" Squadron. 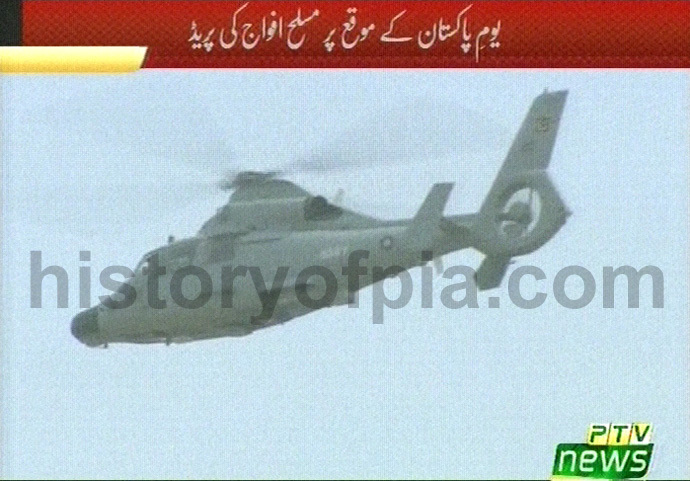 Puma helicopters of Pakistan Army Aviation No. 28 "Dragons" Squadron. One of Harbin Z-9EC Anti-Submarine Warfare (ASW) helicopters of Pakistan Navy No. 222 Squadron. 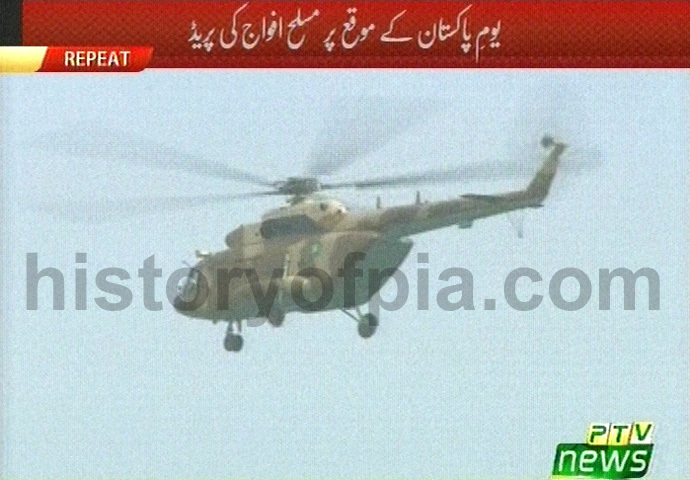 Pakistan Army Puma helicopter using sling technique to carry Special Services Group (SSG) commandos. Commandos in white colour uniform are for high altitude operations and commandos in camouflaged uniform belong to Pakistan Navy SSG. Three of thirty-four Cessna T-37 Tweet aircraft gifted by Turkey to PAF led K-8 Karakorum aerobatics team "Sherdils". K-8 Karakorum aerobatics team "Sherdils". 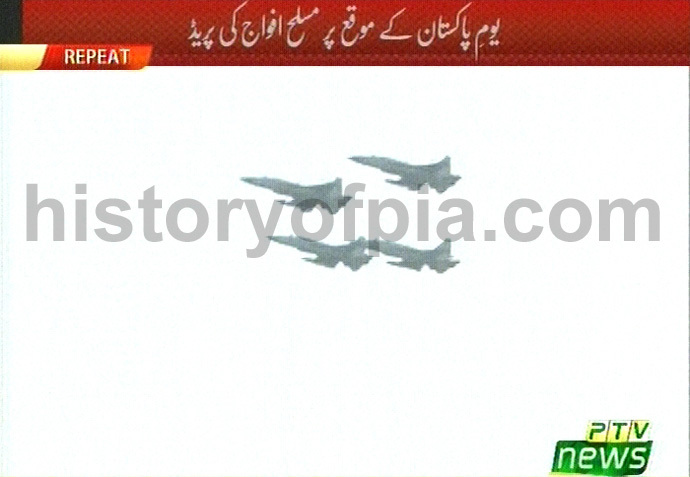 Solo display by JF-17 Thunder belonging to PAF No. 26 "Black Spiders" Squadron. Solo display by F-16 Fighting Falcon belonging to PAF No. 9 "Griffins" Squadron. This PAF CN-235 dropped paratroopers belonging to Pakistan Army, Pakistan Navy and PAF over the parade venue. PAF No. 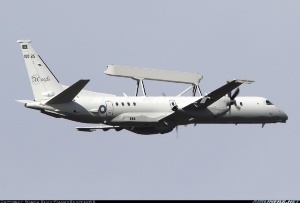 3 Squadron KE-03 Karakorum Eagle Airborne Warning and Control System (AWACS) aircraft serial number 14-004 and Saab 2000 ERIEYE AEW&C aircraft serial number 10025 photographed on March 23, 2016. Photos taken on March 23, 2016. Saab 2000 ERIEYE AEW&C aircraft serial number 10025 of PAF No. 3 "Angels" Squadron. Eurocopter AS550 Fennec multi-purpose helicopter serial number 786403 of Pakistan Army 101st Aviation Group's "Night Stalkers" Squadron. 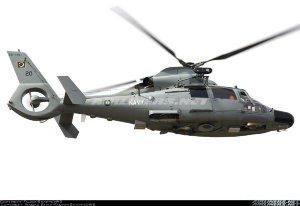 Harbin Z-9EC Anti-Submarine Warfare (ASW) helicopter serial number 20 of Pakistan Navy No. 222 Squadron.